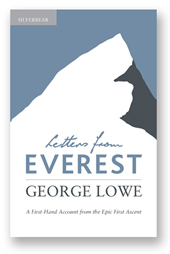 Our first title in the Silverbear series.Sixty years after Mount Everest was first climbed, this unique book of letters celebrates, in a very personal way, this most majestic of mountains. With exclusive access to the private archives of pioneering New Zealand climber George Lowe, this is a welcome tribute to an unsung hero. The ascent of Everest in the summer of 1953 was one of the twentieth century’s great triumphs of exploration. George Lowe’s efforts on the mountain were crucial to the endeavour. In this touching book, a trove of unpublished letters from the Lowe collection are brought together for the first time, to describe the day-by-day moments of this historic expedition as never before. In clear and elegant prose, this is a unique testimony of a superlative human achievement.